Home › Home Improvement › Anti Static Wrist Straps - 3 Pack - Reusable Anti-Static Wrist Straps Equippe..
Anti Static Wrist Straps - 3 Pack - Reusable Anti-Static Wrist Straps Equippe.. GROUND YOURSELF: These wrist straps enable you to ground yourself while working on sensitive electronics. PREVENTS ESD: Protects your computer from electrostatic discharge damage when you are installing or replacing hardware, such as memory modules, graphic cards, etc. MAXIMUM FREEDOM: The extra long coiled cord can rotate 360 degrees and can reach a length of up to 71 inch (180 cm) for optimal freedom of movement. MAXIMUM COMFORT: The adjustable strap fits your wrist comfortably. It will fit around wrists with a circumference of up to 9.25 inch (23,5 cm). IMPORTANT NOTE: Never connect yourself or any hardware you are working on to the mains electricity or any other electric power supply. 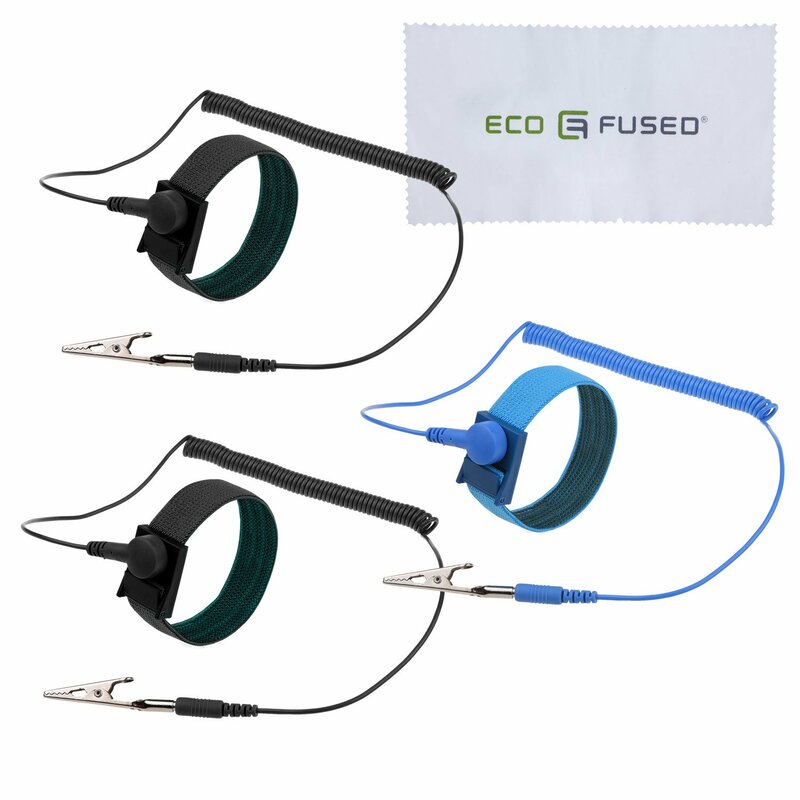 Size: 3 Pack | Color: 2x Black + 1x Blue 3-pack of reusable anti-static wrist straps equipped with grounding wire and alligator clip These wrist straps enable you to ground yourself while working on sensitiveelectronics. Protects your computer from electrostatic discharge damage when you areinstalling or replacing hardware, such as memory modules, graphic cards, etc. The extra long coiled cord can rotate 360 degrees and can reach a length of upto 71 inch (180 cm) for optimal freedom of movement. The adjustable strap fits your wrist comfortably. It will fit around wristswith a circumference of up to 9.25 inch (23,5 cm). NOTE: Never connect yourself or any hardware you are working on to the mainselectricity or any other electric power supply. Contents: - 3x Wrist strap with grounding wire and alligator clip - 1x Cleaning cloth Eco-Fused If for any reason you are unhappy with any product by Eco-Fused, please do not hesitate to contact us. We take full ownership and responsibility for the quality of our products and will do our very best to solve your problem quickly and efficiently! Eco-Fused-USPTO 86127507- is a registered trademark protected by US Trademark Law. Eco-Fused products are sold by authorized sellers only.